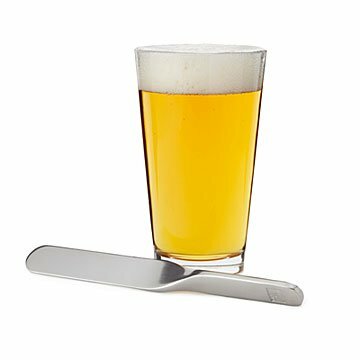 Perfect your pour with this elegant tool that lops off excess foam and locks in fine beer's fresh aromas. Beer geeks can be persnickety when pursuing the perfect pour. There's a correct angle to hold the glass. An exact moment to change it. And a right way to handle the head. Lop off the top with this beautifully polished stainless steel tool. It skims smoothly over the glass at the optimal angle, creating a thin barrier that locks in aromas. (We didn't know that, either.) Time for the first sip! Ahhhh, frisky freshness well worth the fuss—even if you're not a beer geek. Made in China. 7.8" x 0.8" x 0.8"